During the Quinceanera, the 15-year-old guest of honor will be presented with several traditional gifts, including Quinceanera rings. The Quinceanera ring, symbolizing the circle of life, is used as a place marker to hopefully be replaced by an engagement or wedding ring. The ring also has religious meaning, hoping to remind the Quinceanera of God's unending love. In fact, at the Quinceanera mass, the priest will bless the ring and all gifts of jewelry. After the ring is blessed, it is presented on a special pillow to the fifteen year old during the mass by one of her padrinos, or godparents. A tiara - Symbolizes growing up. A scepter - At the mass, the Quinceanera will trade a bouquet of frivolous flowers for a more responsible scepter. Religious items such as a rosary, cross, or religious medals so she's reminded of her faith. Earrings which will remind her to listen to her heart and to God. Fingerhut offers a 10K gold heart with the number 15 inside. Zales offers a variety of quinceanera jewelry with gemstones. 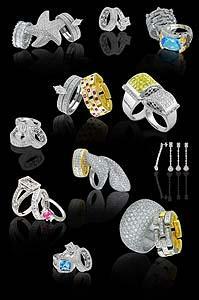 Gordon Jewelers has a lovely assortment of Quinceanera rings and other jewelry. Everyone's favorite auction site, EBay, offers a large variety of Quinceanera rings. Who knows? Yours could be the winning bid! Pictures on Gold has a great selection of rings for teens.